Spacious & Updated Home with Elevator! Includes Private Pool & Free Beach Service! Reminiscent of an Italian manor, Under the Tuscan Sun will leave you amazed. This tri-level palace boasts every nicety, extra and upgrade that one could desire. Not to mention that it enjoys private beach access as part of the distinguished Avalon beach estates. 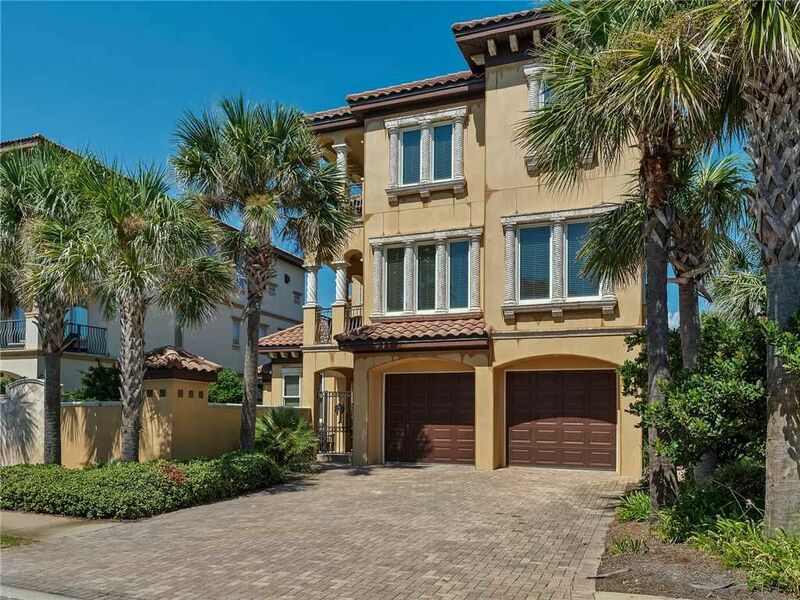 It immediately stands out- towering over Destin with a columned stucco exterior. A pleasant gated courtyard and private walled pool deck with a waterfall welcome you into plush surroundings. Unique and wildly popular stained concrete floors guide you through comfortable bedrooms with palm tree decors. And the first level features a movie room with a plasma T.V and a bar with chilled wine racks. An open kitchen of stainless steel, granite, and chocolate washed cabinets extends out to designer suede couches and dining for 17. Large windows let sunlight flood the room, and a furnished balcony with a grill makes entertaining guests so enjoyable. Home has colossal master suite with private balcony. A granite bar with yet another chilled wine rack lets you enjoy a glass of your favorite wine as you watch the sunset. Walls the shade of the sky on a summery day and warm carved wood furnishings instantly calm you. The bathroom is also stunning with his and her vanities, a glass walk in shower and travertine tile throughout. And the Jacuzzi tub is spectacular, surrounded by columns and a picture window overlooking Destin’s lovely tree line. Me, my husband, and our wedding party stayed here while we got married on the beach! It was absolutely perfect, and made for great getting ready pictures before the ceremony! We stayed for spring break and loved the location not to mention the extra amenities that Newman Daily provides with the beach service and free activities. There was a fridge in the garage for extra storage too. We would definitely stay here again and will use Newman Daily again. Home has lots of space for the extended family and the pool was just perfect for relaxing after a day at the beach. It does need some attention to the appliances, the refrigerator didn't cool after being cleaned the day before we checked in, not all the burners worked on the stove and the dishwasher was difficult to operate. Would still recommend, but could use some upgrades. We just got home. And I'm already home sick for under the tuscan sun !! We've stayed in this home 4 years in a row. We meet our children and grandchildren here every August. This home provides something for everyone. Everyone Hanging out in the family room,while some cook is totally a memory maker. The outside shower is perfect when coming in from the beach,especially before jumping into the private pool.beach access is just across the street. Can't say enough about this home. We'll be back in august. Thanks for helping us make memories.